We do not know how Jacques Cartier learned the art of navigation, but Saint-Malo, the town where he was born between the summer and winter of 1491, was at the time one of the most important ports in Europe. In 1524 he probably accompanied Giovanni da Verrazzano on unofficial explorations initiated by the king of France. Some ten years later, Jacques Cartier was a sufficiently experienced navigator to be asked by Francis I to undertake the official exploration of North America. There is no doubt that he was already familiar with the sea route that he took in 1534. On March 19, 1534, Cartier was assigned the mission of “undertaking the voyage of this kingdom to the New Lands to discover certain islands and countries where there are said to be great quantities of gold and other riches”. The following April 20, the navigator from Saint-Malo cast off with two ships and a crew of 61. Twenty days later he reached Newfoundland. The exploration began in an area frequented by Breton fishermen: from the Baie des Châteaux (Strait of Belle Isle) to southern Newfoundland. After erecting a cross at Saint-Servan on the north coast of the Gulf, Cartier tacked to the south. He first encountered the Magdalen Islands, and then set course for present-day Prince Edward Island, failing to notice that it was in fact an island. Cartier then moved on to Chaleur Bay, where he encountered some Micmacs on July 7. The talks were accompanied by a swapping of items, which history has recorded as the first act of trade between the French and Amerindians. Soon after, Cartier reached Gaspé Bay. More than 200 Iroquois from Stadacona (Québec) were on the peninsula to fish. 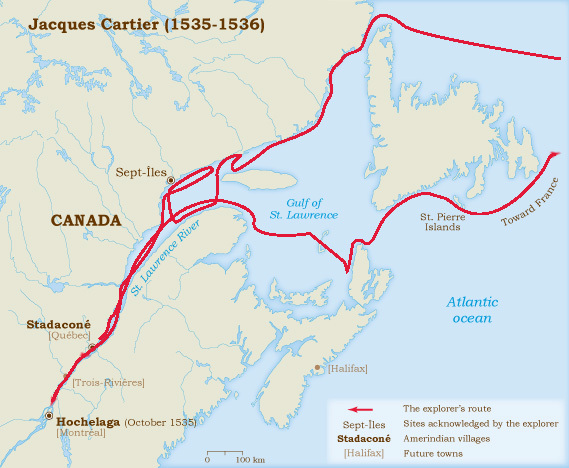 Initially trusting and cordial, relations were tarnished when Jacques Cartier claimed possession of the territory on July 24. The 30-foot cross he erected at Pointe-Penouille seemed improper to Donnacona, the Native chief. Fearing the consequences of this discontent, Cartier lied, describing the cross as an insignificant landmark. Jacques Cartier in Gaspé On the 25th he left the Gaspé area, heading for the Gulf of St. Lawrence. After navigating the strait separating Anticosti Island from the north shore, he set off again for Saint-Malo, where he landed on September 5. The St. Lawrence River had not been discovered. Jacques Cartier arrived in France with two precious trophies: Domagaya and Taignoagny, the sons of Donnacona, whom he had convinced to come with him. They told him of the St. Lawrence River and the “Kingdom of the Saguenay”, the objectives of his second voyage upon which he set forth on May 19, 1535. Cartier had been persuasive: his crew had doubled and he had command of three ships: the Grande Hermine, Petite Hermine and Émérillon. Fifty days after putting to sea, a first vessel laid anchor off the shores of Newfoundland. On July 26 the convoy was reunited, and exploration could begin again. On August 10, the day of St. Lawrence, the explorer gave the saint’s name to a little bay. Cartographers later applied it to the the “great river of Hochelaga and route to Canada” leading to the interior of the continent, “so long that no man has seen its end”. Sailing along the river to Stadacona (Québec), the ships passed Anticosti Island and the mouth of the Saguenay. Cartier established his headquarters on the Sainte-Croix (Saint-Charles) river, and five days later boarded the Émérillon to travel to Hochelaga (Montreal). Leaving the ship in Lake Saint-Pierre, he proceeded in a small craft to the Iroquois village, where he arrived on October 2. There were nearly 2,000 people living there. The island and village were overlooked by a mountain, which he named mount Royal. He was taken there by his hosts, who spoke to him of the riches of the west, and again of the “Kingdom of the Saguenay”. The rapids north and south of Montreal Island prevented him from continuing his route to the west. Cartier had to return to harbour on the Saint-Charles river, where he found that relations with the Iroquois had become more acrimonious. The threat of an early winter lay before the Frenchmen. From mid-November, the ships were imprisoned in the ice. December began with an epidemic of scurvy. The Iroquois, the first affected, were slow in delivering up the secret of anedda, a white cedar tea which would save them. Of the 100 Frenchmen afflicted, 25 died. On May 3, Cartier planted a cross on the site where he had just wintered. The same day, he seized about ten Iroquois, one of them Donnacona, the only one who was able to “relate to the King the marvels he had seen in the western lands”. The voyage back began three days later, without the Petite Hermine. Following a swerve along the Newfoundland coast, Jacques Cartier discovered the strait which bears the name of the explorer Giovanni Caboto. On July 16, 1536, Cartier was again in Saint-Malo. 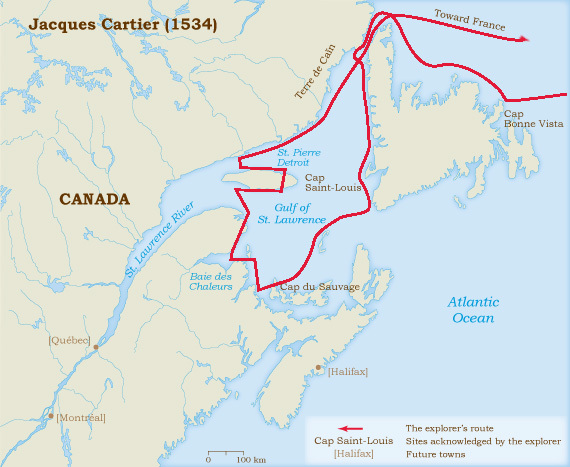 On October 17, 1540, Francis I ordered the Breton navigator to return to Canada to lend weight to a colonization project of which he would be “captain general”. But on January 15, 1541 Cartier was supplanted by Jean-François de La Roque de Roberval, a Huguenot courtier. Authorized to leave by Roberval, who was awaiting the delivery of artillery and merchandise, Jacques Cartier departed from Saint-Malo on May 23, 1541. He led five vessels “well provisioned with victuals for two years”, including the Grande Hermine, Émérillon, Saint-Brieux and Georges. There were 1500 people travelling with him. The crossing took more than three months. With the exception of one little girl, all the Iroquois died in France. Cartier admitted the death of Donnacona, but claimed that the others “had remained in France where they were living as great lords; they had married and had no desire to return to their country”. Being no longer welcome in Stadacona, the colonists settled at the foot of Cap Rouge (Cap Diamant), named Charlesbourg Royal. The experience was a disaster. In June 1542 Cartier left the St. Lawrence valley with the survivors. At Newfoundland he met with Roberval’s group, which had only left La Rochelle in April. The night after their encounter, Cartier placed the entreprise in jeopardy by slipping away from his leader. He landed in Saint-Malo in September. Jacques Cartier would never return to Canada. As for Roberval, he continued on to Charlesbourg Royal, which he renamed France-Roi. After putting up with the climate, scurvy, quarrelling and adversity, his colony was extinguished in 1543 with the repatriation of those who survived.